All Powder coated finish and using two vertical and one horizontal steel roller Identical to CRS1 for taking the heaviest cables round difficult corners. The assembly is of a robust construction for use in the most arduous conditions and can be linked together with stake pins provided to form a continuous corner Roller system. The Triple Corner Cable Roller used by the DNO, utility and cable laying contractor for pulling in low and high voltage electric cables. All Powder Coating with Plastic Coated Heavy Duty assembly suitable for Cables up to 125 mm Diameter. Steel Frame Fitted Large waited Steel Roller Running on Sealed Ball Bearings. Years of understanding of this domain, has helped us in presenting clients with the superior quality of Bridge Cable Roller. For the purpose of pulling in low and high voltage electrical cables, the bridge cable roller is used in different industrial applications. Manufactured by using steel frame, the bridge cable roller is known for its load capacity of 1000 kilogram. Banking on the modern infrastructural facility and dexterous professionals, we present clients with the best grade of Straight Line Cable Roller. These straight line cable rollers are manufactured by using latest technology and are known for their load capacities of maximum 1000 kilogram. The base size of the straight line cable roller is 350mm x 230mm. 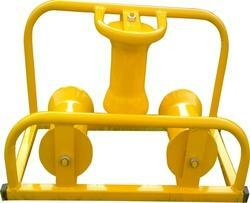 This Manhole Cable Roller are used in Manhole Cable Laying work. 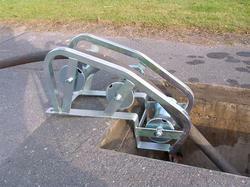 This designed for placing at the end of the manhole or pit entrance to ease the cable in. 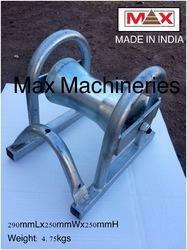 Triple Steel Roller on tubular steel frame. Heavy duties Manhole Rollers have unique design. The standard Cable Roller used by the DNO, utility and cable laying contractor for pulling in low and high voltage electric cables. 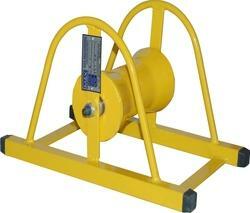 Cable Rollers for Pulling In Low & High Voltage Power Cables into Cable Trench & Cable Duct.